Place tarragon and berries in a clean 16 ounce glass jar. 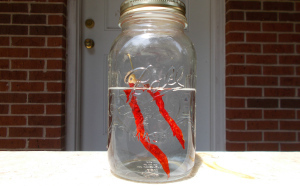 Slowly pour in the vinegar, cap the jar and store it in a cool dark place. Allow the flavors to mellow a few days before using. Place herbs and vinegar in a clean 16 ounce glass jar. Cap the jar and store in a cool dark place. Use within a month.